American Hornbeam (American Ironwood, Blue Beech) Carpinus caroliniana - Rounded growth habit and medium shade cast with delicately shaped leaves that turn a beauiful yellow in fall. Spring brings pendulous yellow flowers that develop into nutlike seeds. Hardy to -30F (-39.9C); height: 45ft. 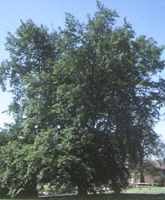 European Hornbeam (European Ironwood) - Carpinus betula - Rounded upright growth habit, a short trunk and medium shade cast. with pendulous yellow flowers in the spring and a gorgeous yellow fall color and nutlike fruits. A good windbreak or screen tree, hornbeams prefer an open sunny location and moist loamy soil, though they are very tolerant and will do well nearly anywhere. Hardy to -30F (-39.9C); height: 45ft.